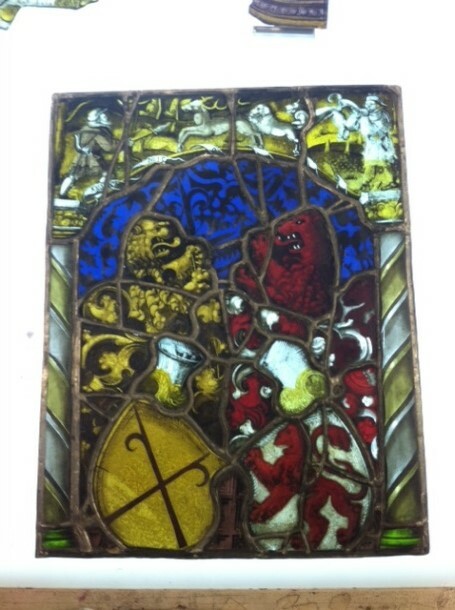 This summer I was fortunate enough to have the opportunity to work one on one with the Metropolitan Museum of Art’s stained glass conservator, Drew Anderson. We began by learning the basics of how to use both glass and lead. Three basic skills that any glass conservator should know are the following: glass cutting, leading, and soldering. 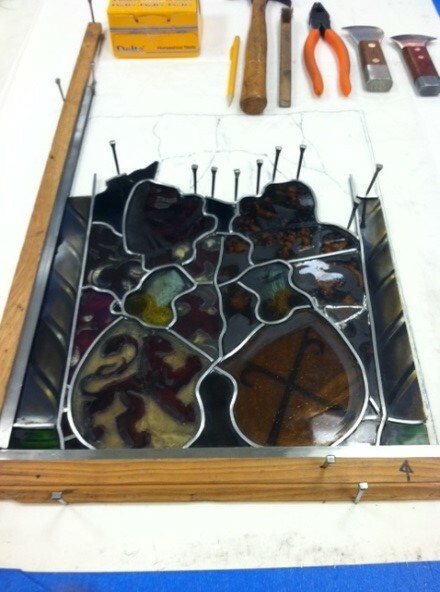 These are the main components of both creating and restoring a glass window. Before I could begin to work on any works of art, I found it incredibly helpful to create a few windows of my own in order to better understand how the windows are put together. My two preliminary windows were: (1) a clear plate glass window consisting of only straight lines and (2) a stained glass window with a still life composition of organic lines. Once I had a better understanding of how stained glass windows are put together, I moved on to learning how to clean a window. Surprisingly, most of the cleaning is done with water and ethanol. For slightly more substantial cleaning, acetone is used as well. The two basic cleaning tools used are: (1) a variety of scrapers, used to remove excess dirt and grime from the surface; and (2) a thin wooden dowel with cotton on the end, used to clean remaining dirt by rubbing lightly and in a circular motion. In addition to these cleaning methods, I also learned to fill out the comprehensive conditions reports that must be filled out for each window that is worked on. It is essential to record as much as possible about the window itself and about each restoration process it undergoes so that any future conservator knows exactly what the history of the window is. Included in this report is information regarding the glass, lead, and paint of the window, as well as any previous restorations. 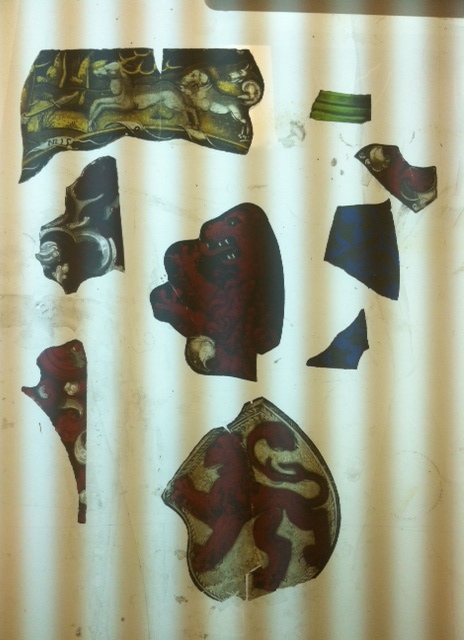 Each of these three materials requires substantial observations before beginning any conservation work at all. For example, one must note the types of glass, lead, and paint and then look for any visible cracks, signs of deterioration, areas of paint loss, poor leading, etc. 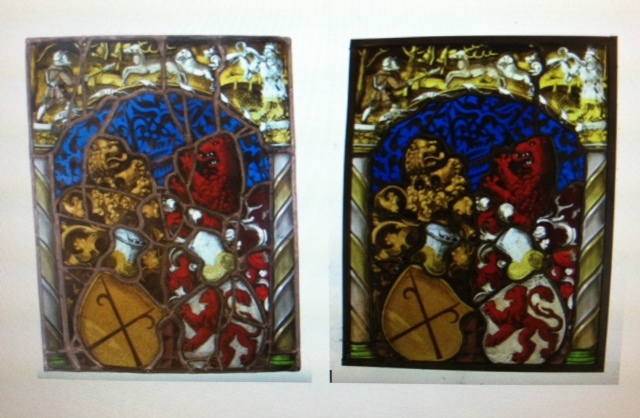 Each of these reports takes time and patience but is ultimately a conservator’s necessity when working on a window. 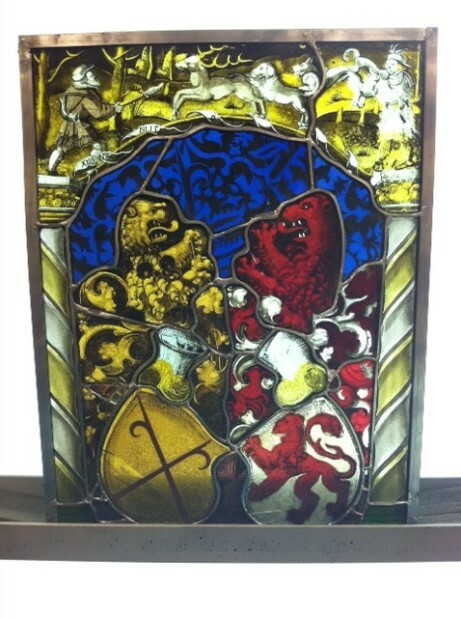 Once I had cleaned several smaller windows, I was given a much larger one to spend the rest of the summer with—a 16th century Swiss stained glass window, depicting two family coats of arms and a hunting scene. The window had been left in storage and the previous re-leading repairs were of very poor quality. The window also had a number of cracks in need of repair. Before beginning restoration, it is important to look at the window from a strictly visual point of view to analyze which of the leads do not belong; in other words, which leads were used as quick repairs that now hinder the overall aesthetic of the image being presented. There were a number of these in my window and due to the poor lead quality overall, I needed to take the entire window apart and put it all back together with new leads. Here are two images of my window at the start of the process—the first before any work was done and the second once all of the lead was removed. As you can see there are quite a few leads that clearly do not belong. Once the leads were completely removed, I spent a few weeks cleaning each piece with both the mixture of water and ethanol and then acetone. After everything was clean, I began to look at the pieces to see which repairs could be done. In general, there were three different kinds: (1) a clean break repair, (2) a copper foil repair, and (3) a resin fill repair. The easiest repair to complete is a clean break repair. 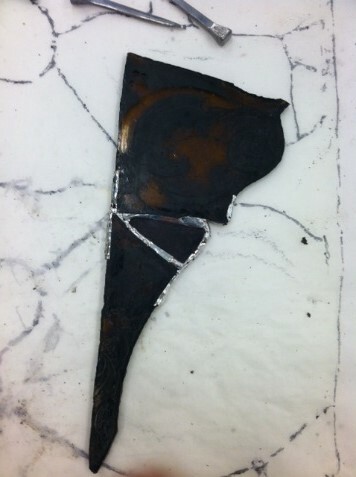 This is when the broken pieces of glass have a smooth edge; this allows the conservator to place them directly back together with no missing fragments or rough edges. I performed a number of these repairs using Hxtal, an epoxy used to bond glass. After placing scotch tape on the back of the two pieces to hold them together, I placed Hxtal in small drops along the seam of the break. This sits for a few days before the bonding is complete. 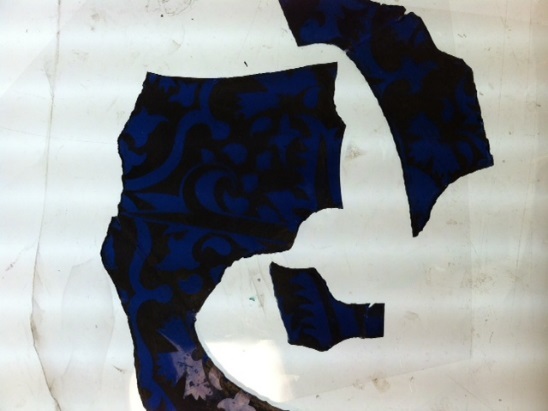 This kind of repair can be seen with the pieces in the image below. 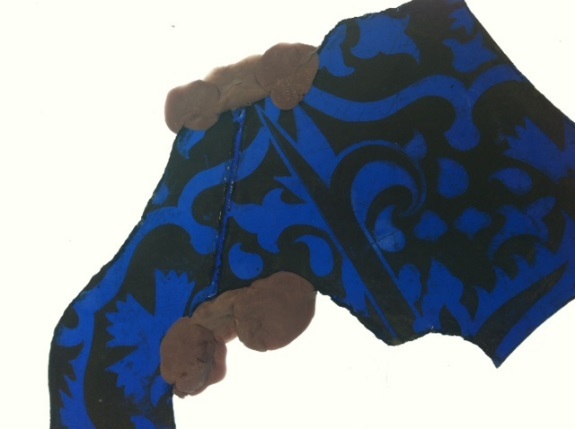 The second type of repair is the copper foil repair. This kind is usually used when a piece of glass has been replaced. From a theoretical standpoint, it is important to preserve the original window first and foremost. That being said, it is also important to preserve the history of the window, and that includes later replacement pieces. A copper foil repair is noticeable but not as distracting as an additional lead. This way, when the window is finished, the observer can note which pieces were replacements while still being able to enjoy the window as a whole. I had to perform one of these repairs for my window. 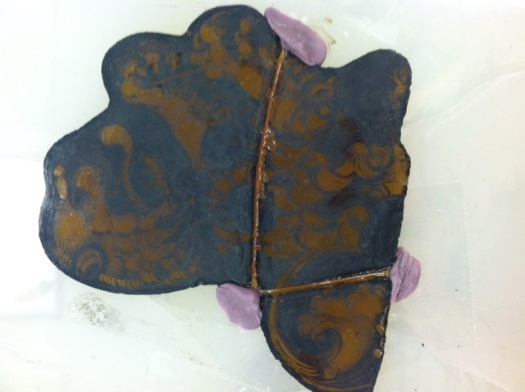 The process involves taking a very thin piece of copper and laying it between the pieces. Then using a soldering iron, the pieces are bonded together; the solder results in a silver color, as opposed to the copper which would be more noticeable. Unlike the Hxtal repairs, this bond is created in seconds. 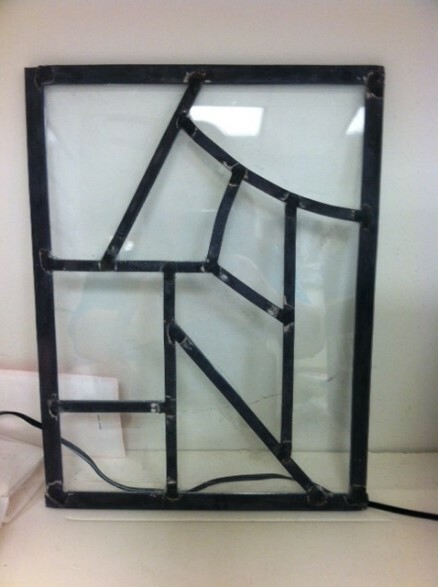 Here is an image of the three pieces copper foiled together for my window. The final and most extensive repair that I completed was the resin fill repair. These kind of repairs are done when the edges of the broken pieces are rough or missing sections. You place the pieces close together but with a small gap between them, making sure to line up the painted design as closely as possible; then place them on a piece of tape to secure their position. After the pieces are set, a dental putty is mixed and placed on either end of the gap between them and then glue is used to seal the bond between the pieces and the putty. This is to diminish the chances that the resin will leak out of the gap. 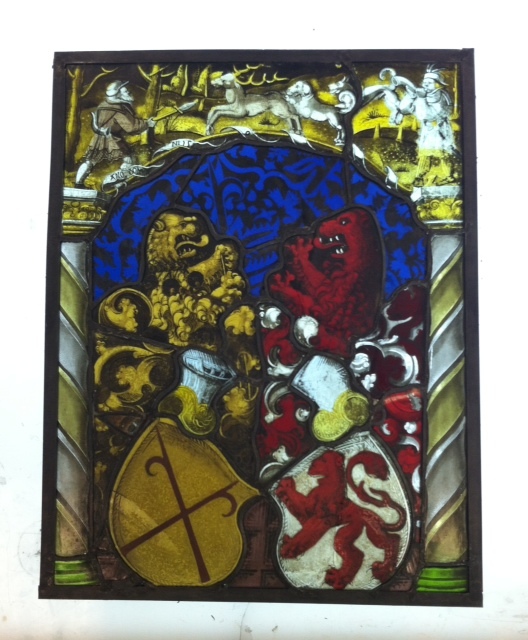 Once again, Hxtal is used for the repair, but this time it has to be colored to match the base color of the original glass. This process is essential because if the base color of the glass does not match the repair, it will be a glaring mistake in the finished window. Once the color is matched, the gaps are filled with the colored resin and left for a few days to set. Some examples can be seen below. After the fill is dry, the hardest part of the restoration begins—the conservator must paint the gap to disguise any sign of a repair. In addition, not only do the colors have to match the pieces, but they must also match with light shining through them because this is how they are meant to be viewed. To match colors with and without light shining through them is a huge challenge, not to mention that it must be painted to match the composition of the panel. This was my favorite part of the process; coming from an art background, I loved being able to fool the viewer by hiding my repairs. It has an incredible effect when it is done and gives the overall piece a more complete look. Here are some images of completed paint jobs. 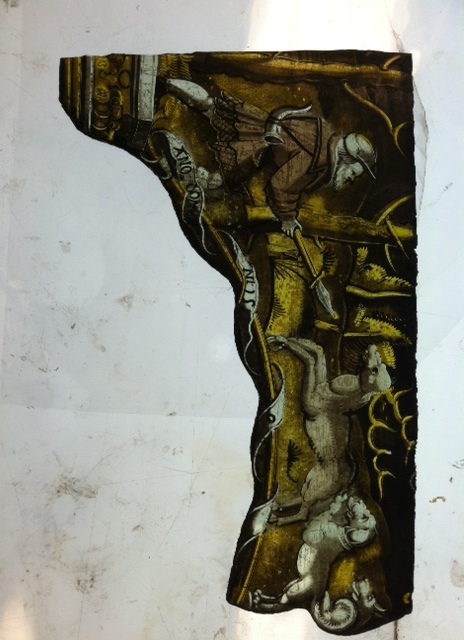 The last two photos depict the hunting scene before and after glass and painting repairs. My window went from 50 pieces to 30 pieces after all of my repairs were completed, and while I was unable to fix all of the issues with the window, I repaired the majority of them. Once all of the pieces were addressed, it was time to put the window back together. The leading process can be difficult, especially after making repairs. One must take into account the changes that were made and as a result, the pieces might not fit together as neatly as they did originally. 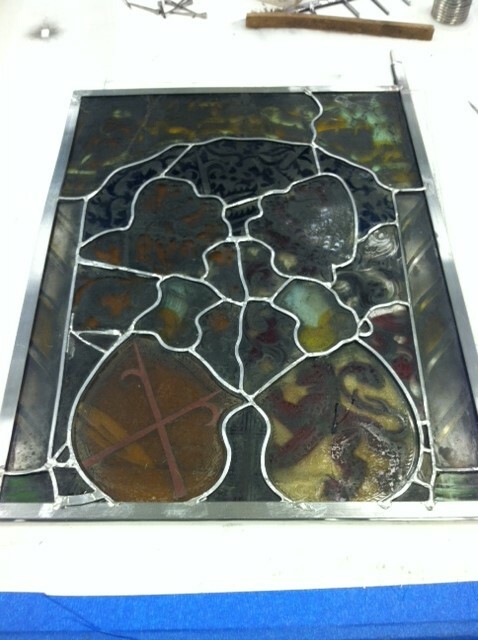 After the leads are reinstalled and the entire window is set, the joints are soldered together. Any loose pieces or small gaps can be filled with cement putty after the soldering process. This results in a solid and secure window, with no concern for unfixed pieces or gaps that cause breaks in the composition. These steps can be seen in the images below. Now that the window is back in one piece, any minor paint fixes are done. 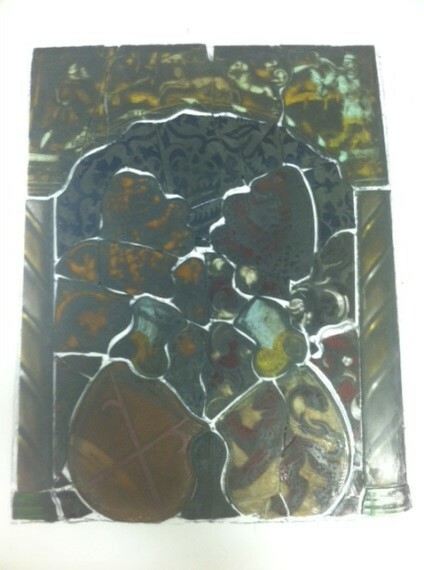 Finally, the leads on the front of the panel are darkened with patina to give the window its final appearance. The darkening of the leads allows the light to come through the glass and create the desired image without the distraction of the bright silver lead. Here is the final product as well as a comparison of the window before and after all of my restoration work. Working with Drew at the MET was an absolutely incredible experience. The skills that I have learned and the experience I have gained have not only left me feeling confident in the stained glass conservation field but also all the more interested to continue my study of it. I am looking forward to pursuing both research (in the form of my thesis) and hands on experience in this field. I read about your intern work and was very impressed with all that you achieved during your summer at the MET. I graduated from Columbia in 2007 and spent my summer internship at the Landmarks Preservation Commission and had a wonderful time working there. I have an important glass lamp shade that was recently damaged and I was wondering if you might be able to spare the time in the middle of your studies to make the necessary repairs. Please send me an email at my address, mainstreetpartners.peter@gmail.com, if you’d like more information about the lamp shade. I will send you a photo showing the repair problem. 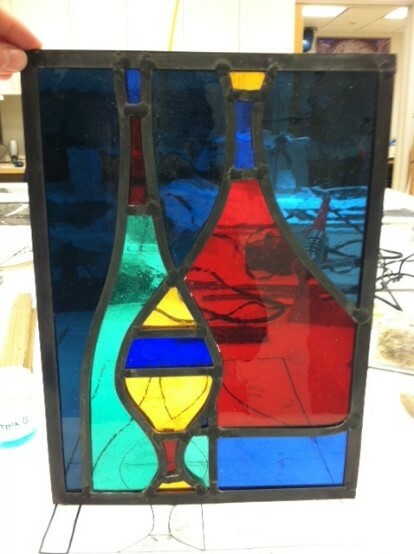 Fortunately, no glass was damaged and the repair work should not be too complicated to complete but will require skills similar to those you learned during your internship. I will be more than happy to pay you whatever you suggest is appropriate for this work.